I know it seems like I make every recipe I see with halloumi. That might actually be true. But, at least I had to wait to make this one. I read about it weeks ago and bided my time until pepper season arrived. 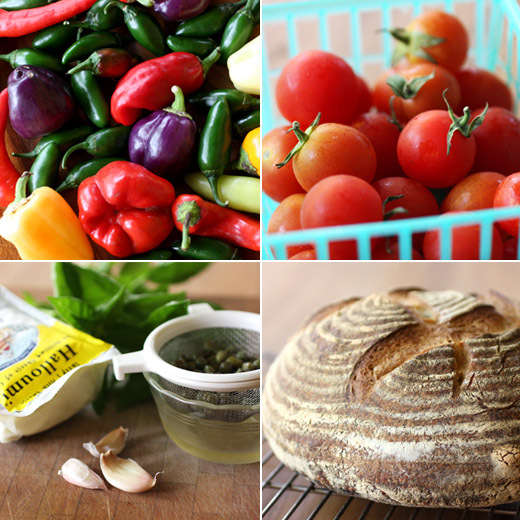 By this point in the summer, the tomatoes are struggling with the heat here, but peppers in every color and shape can be found at the farmers’ markets. This dish is from Deborah Madison’s latest, Vegetable Literacy which was a delightful read. It’s about growing vegetables and cooking vegetables, and it’s organized by botanical family. As I read the book, I found myself wanting to grow things like sorrel, from the knotweed family, and cardoons from the sunflower family. I’d never thought about growing those things before. And, maybe heirloom beans and Jerusalem artichokes deserve an attempt in my garden. I loved that she mentioned vegetable varieties that are on Slow Food’s Ark of Taste like Amish Paste tomatoes, tepary beans, and red fife wheat. It makes me want to seek out interesting plant varieties whenever I can. Following the info about each plant family and where and how its members grow, there are tips for how to use the vegetables or how to clean, peel, or prep them when appropriate. Then, there are, of course, recipes. There are so many thoughtful ideas sprinkled throughout the book like variations on recipes, gardening tips, and ways to use all the parts of plants that I look forward to going back and re-reading sections. Since Deborah Madison lives in New Mexico, she has a lot to share about peppers and chiles and many, many ways of using them. 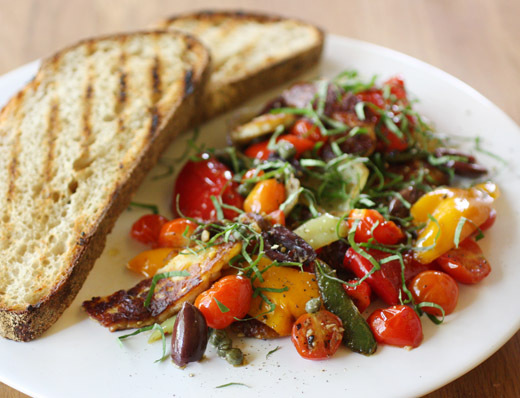 For this dish, sweet peppers and/or some hot chiles were sauteed and combined with olives, capers, tomatoes, and browned halloumi for scooping onto grilled bread. 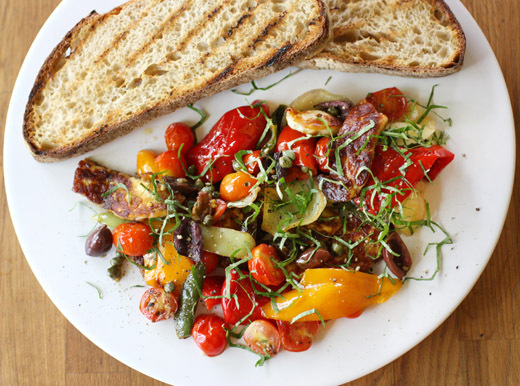 She mentions that she first learned of this dish when it was made with sun-dried tomatoes, but she prefers using fresh cherry tomatoes. I followed her lead. Halved cherry tomatoes, halved Kalamata olives, rinsed and drained capers, and some minced garlic were left to marinate in a few teaspoons of olive oil while proceeding. Seeded peppers cut into wide strips were sauteed over high heat in olive oil. I used a mix of colorful sweet peppers and a few jalapenos. Once the peppers collapsed from cooking, they were removed from the pan and added to the tomato mixture. Next, sliced halloumi was seared until golden on each side in the same pan. The pepper and tomato mixture was returned to the pan with the halloumi just to warm through, and then it was all topped with chopped herbs. Parsley and mint are suggested, but neither of those is growing in my garden right now. I used basil instead. I had just baked a sourdough boule, so I grilled thick slices to accompany the peppers and halloumi. The salty, seared cheese with the sweet and spicy peppers, tomatoes, and briny olives and capers was a delicious mix. I also would have enjoyed this tossed with pasta or maybe with crunchy croutons or pita chips like a take on panzanella. There’s another version of a sauteed pepper salad with lemon that I want to try, and the grilled pepper relish, red chile paste, and pepper sauce are on my mind as well. For any season and any vegetable, I know where to get inspired. A wonderful combination and dish! So colorful, flavorful and appetizing. Wow, that's an abundance of peppers and chilli over there - am referring to the collage. This looks amazing! And definitely perfect for the season -- will be trying soon! I'd never heard of halloumi until now! A light and beautiful meal, Lisa. Your sourdough boule looks awesome too. Deborah Madison is a really good cookbook author. Thanks for the heads up on her new book. This looks like a wonderful recipe! hahaah, I like haloumi, so I am happy to find new recipes containing it. I am of course, mesmerized by your sourdough boule... gorgeous! Hi Lisa -- I've nominated you for the Liebster Blog Award (http://bit.ly/12Gwfc6)! I love your blog, creative recipes, and friendly and approachable writing style. Grilled halloumi is the best! I enjoy sundried tomatoes but the fresh ones, if they are seasonal, are even better. But peppers make a great splash of colour on the plate and I love them grilled and peeled. That's my perfect summer meal right there. Now, if only the squirrels don't get to all my home-grown tomatoes before I do. I love the vibrant colors!! So summery! I love halloumi. This is a fun way to serve it. I decided this summer that I actually need to give careful planning for a vegetable garden next year. I feel like I'm missing out on all this seasonal goodness. Even the farmers' markets around here are lacking. I adore Halloumi, Lisa and I can't think of a better way of presenting it. I'm with you Lisa, Haloumi is so tasty and has an incredible versatility! The salad looks amazing fresh and summery. I have yet to try haloumi! I feel like I'm totally missing out on some amazingness! This is such a summery delicious dish - looks so gorgeous! OH MY! This looks super cool!! I love Halloumi and experiment quite a lot with it. Loved this recipe. Glad to meet another Halloumi fan! This looks like such a light and lovely summer meal! This would make me very happy! As is, on toasted bread or combined with pasta, especially with the summer tomatoes finally making their debut here. Yum! My favourite things all on one plate. The more salty foods the better for me :) Those tomatoes look very fresh!